Great Audi Q7 car Leasing & Contract Hire Deals. Our Audi Q7 Lease Deals. Audi worked and worked on the old Q7, but all the polish in the world couldn't bring it up to the pace of the class best. Something radical was needed and something radical just happened. Significantly smaller, lighter and more agile but, thanks to smarter packaging, bigger in the passenger cell, the latest Q7 offers efficiency measures that are night and day compared to its Panzer-like predecessor. Even the shape subtly morphs into something more estate car-like. It'll be interesting to see whether the Q7's blend of talents can convince a market where many buyers choose according to predetermined brand loyalty. Can it bring customers back to a model that was never a front-runner? We wouldn't bet against it. The Audi Q7 has turned from a blunt implement to one of the sharpest vehicles in its sector. Who knows, it might even have pioneered a new niche on the sly. We can't help but have a sneaking admiration for what Audi has done here. The launch of the original Audi Q7 back in 2006 was one of those moments that remains etched in the memory. When we first clapped eyes on the thing, it was like a friend showing you a spectacularly ungainly baby. ""Well, he's certainly a bonny lad. What a bruiser,"" you felt like saying. Let's just say the Q7 wasn't about to win many beauty contests. We ran one for a while and grew to respect its build quality, practicality and ruggedness, but weren't so keen on the 4.2-litre V8's prodigious fuel thirst. In replacing the Q7, Audi have gone somewhere few manufacturers dare to go. They've made the car quite radically smaller. More than a foot has been lopped off the length of the Q7 and it's also a bit narrower and lower to boot. That seems a bit of a strange action in a sector where sheer presence counts for a great deal, but in doing so, Audi has also subjected the Q7 to the most radical weight loss plan we've seen in a production car. Ever wondered why there was no S or RS version of the first generation Q7? Because it would have been like trying to turbocharge a continental plate. The thing was so big and lumbering that encouraging drivers to make it go faster would have been a recipe for disaster. The latest car doesn't go down that road either, but with all that weight excised from the chassis, it's a far nimbler thing. That tells in Audi's engine selection too. Most customers choose one of the efficient turbocharged 3.0-litre TDI units, these developing either 218 or 272PS. The alternative is an etron plug-in hybrid version that mates an electric motor with a petrol TFSI V6. Or a flagship SQ7 model that uses a 4.0-litre V8 TDI diesel. The 3.0 TDI diesel's going to be the one getting the most play with UK buyers and it's a good 'un. Most choose the 272PS variant which has almost 600Nm of torque, which gives this Q7 enough about it to be able to mix it with the class best. In fact, 6.3 seconds to 62mph wouldn't be bad for a hot hatch. The Q7 rides on a steel springs as standard, although buyers can opt for air suspension. Another interesting option is a rear wheel steer function. At lower speeds, it counter steers the rear wheels for better manoeuvrability, while at higher speeds it steers them by up to five degrees in the same direction as the fronts to improve handling agility. All very Porsche 911 Turbo. If you didn't have the two cars parked side by side, you'd probably never guess that the latest Q7 is so much smaller. The styling theme is evolutionary, although the car seems to sit lower on its springs, almost like a beefed up Audi super-estate than a typical SUV, an impression compounded by the aggressively raked windscreen. The chassis on which the Q7 sits will also form the basis for forthcoming Porsche Cayenne and Volkswagen Touareg variants, with proposed Lamborghini and Bentley SUVs also using a version. An increased reliance on aluminium has shed weight, with 100kg coming out of the suspension, 71kg out of the body and a massive 24kg from the doors alone. Despite being 370mm shorter, Audi has only reduced the wheelbase of this Q7 by 10mm, so the amount of room available for passengers is still vast. In fact, Audi claims an extra 21mm of kneeroom in the second row. Even the third row gets more space, with 24mm more headroom and an additional 20mm of shoulder width. This third row of seats are now dubbed 'Group 3 child seats,' and are electrically operated, popping up from the boot floor at the flick of a switch. With all seven seats occupied, you get 295-litres of boot space. In five-seat mode there's even more space than in the old model; fully 890-litres to the tonneau cover. The instrument binnacle features Audi's clever 1440 x 550 pixel Virtual Cockpit where you can configure the fascia display as a giant screen in a number of modes. You'll want a decent specification from a luxury SUV requiring a £50,000 budget - and this Q7 doesn't disappoint. Included as standard is a fully revised two-zone air conditioning system. The operating concept uses fewer buttons and controls. Animated symbols in the display, the TFT display and the capacitive toggle switches allow intuitive operation of the air conditioning. There's a whole host of clever options available for the car, but we particularly liked the optional Audi tablets for the rear seats. One (or optionally two) Audi tablets with 10.1 inch screens serve as rear seat monitors. They're connected to the 'MMI navigation plus' system via WiFi, thus gaining access to the radio, media, navigation and car functions of the Audi Q7. Rear seat passengers can surf the Internet via the WiFi connection. Android-based, the system gives access to the huge number of applications, games, movies, music and eBooks in the Google Play Store. At the end of the trip, the Audi tablet can be removed from its mount and used offline or on any external WiFi network. It features a full HD camera, 32 GB of internal storage and an additional Bluetooth and NFC interface for connecting headphones, for example. Improving the aerodynamics, stripping all that weight out of the car and fitting even cleaner Euro6-compliant engines has had massive improvements in overall efficiency. To give an idea of how much better, consider this. 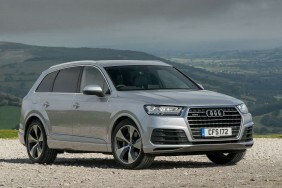 The old Q7 3.0-litre TDI could get 38.2 miles from a gallon of diesel whereas the latest version manages 49.6mpg. Emissions improve to 149g/km. If this still isn't enough, you might want to wait for the 373PS Q7 e-tron quattro; a plug-in hybrid with a six-cylinder diesel and all-wheel drive. Audi claims 166mpg for this one, with CO2 equivalent of less than 50 grams per kilometre. The lithium-ion batteries store 17.3 kWh of energy, enabling a range of up to 34.8 miles in pure electric mode.